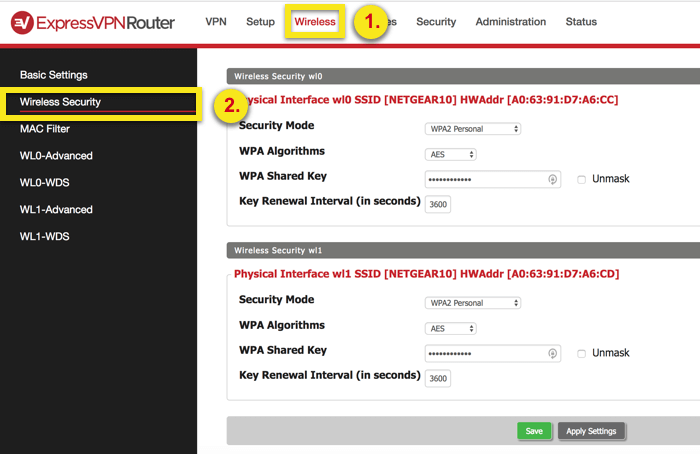 This guide shows you how to change settings on your DD-WRT ExpressVPN Router App. Important: Make sure you’re using the ExpressVPN DD-WRT router app. After signing into www.expressvpnrouter.com, you should see VPN, Setup, Wireless, Services, Security, Administration, and Status in the top menu bar. If not, follow the OpenWRT router app instructions. Click Wireless along the top menu and make sure you’re at Basic Settings. Next to Wireless Network Name (SSID), enter the new Wi-Fi name/SSID for the network of your choosing. Scroll to the bottom of the page and click Apply Settings. Click Wireless along the top menu and select Wireless Security on the left. 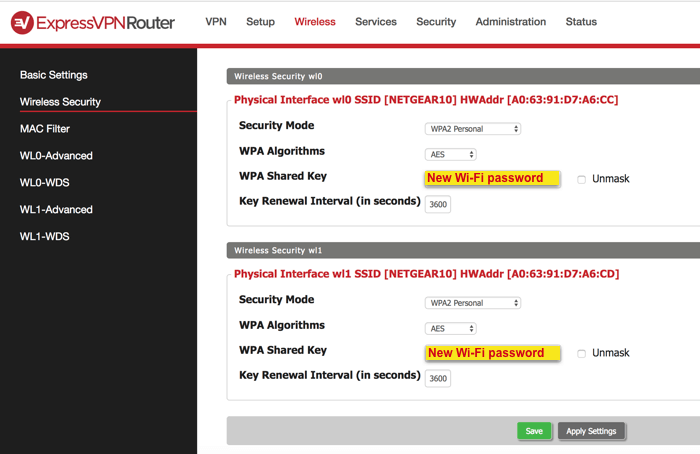 Next to WPA Shared Key, enter the new Wi-Fi password for the network of your choosing. Click on Administration along the top menu. Select VPN along the top menu. In the side bar, click ExpressVPN Help & Support. Click Reset firmware to default settings. When asked to confirm, click Reset firmware to default settings.